A forum to discuss research on the origins of MS and its development. Multiple Sclerosis with atypical MRI presentation: results of a nationwide multicenter study in 57 consecutive cases. • Our current series expands the spectrum of MS patients with atypical radiological findings. Isolated TDL should be considered as a CIS, with a five years risk of MS conversion around 30%. Patients in the TDL-onset MS and ADEM-like MS groups largely presented an acute onset and a later relapsing-remitting evolution. Observation of these atypical MRI presentations firstly raises the question of the conversion rate to MS. Moreover, it raises the concern of the use of an immunomodulatory treatment to prevent relapses/disability. • At the other extremity of the spectrum, patients in the cavitary MS and leukodystrophy-like MS groups overall had a progressive course and a severe evolution. They can be misdiagnosed during years before accurate diagnosis is done. Note: Probably TDL and ADEM-like MS will be considered in the future cases of anti-MOG disease, but a whole classification is still under construction. 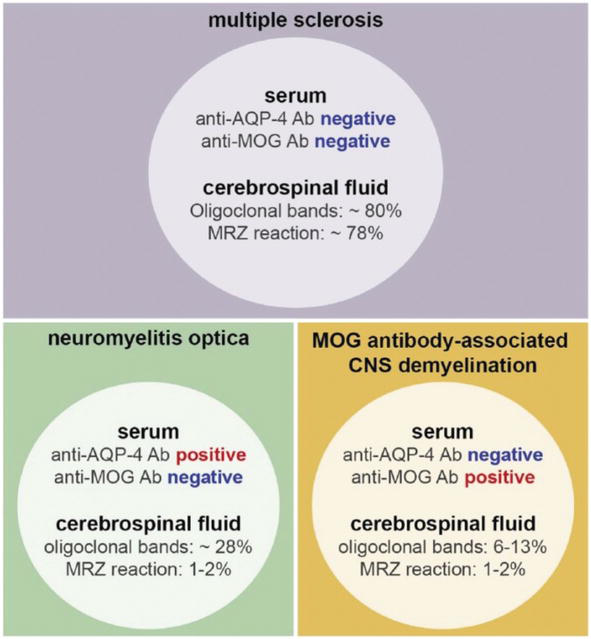 Anti-Neurofascin-155 is an auto-antibody whose presence has been separated from standard MS, like it was for anti-AQP4 and anti-MOG before. Get yourself tested if this is your case.